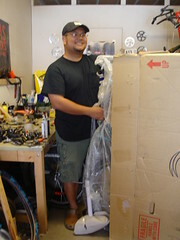 Having worked at a shop, building (assembling) bikes was something I became pretty good at. At times I can put 2-3 bikes together in an hour. 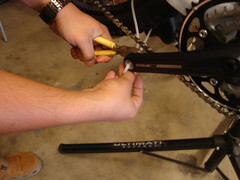 While doing this, I learned a few tricks that will help you put your new bike together quickly. First and foremost, you’ll need some basic tools. 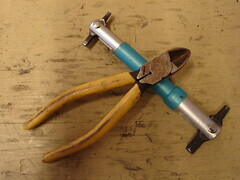 A pair of diagonal cutters and some sort of allen tool that has a 4,5, and 6mm head. If you have a workstand, even better. 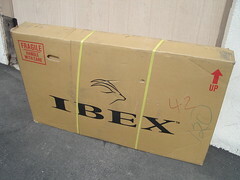 The bike I’m putting together is the Ibex Ignition 3 that we received a few days ago. Most bikes you get shipped to you comes in a standard bike box. What I then like to do after opening the box, is stand it straight up. While its up, I’ll grab the top tube, and pull the bike out. 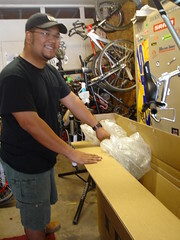 I found that this method has been better on my back than having to bend down and lift the bike out of the box. It’s pretty important that you grease the seat tube. 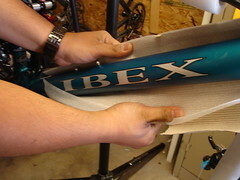 This will help prevent scratches on your post and minimize creaking while you’re riding. 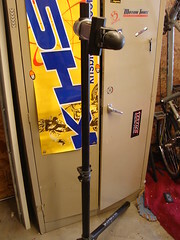 Then mount the bike via seat post onto the work stand. I like to keep the bike box near me because theres TONS or packaging that comes on these bikes. You can use it as a trash can. You’ll want to start cutting off any zip ties you find on the bike. 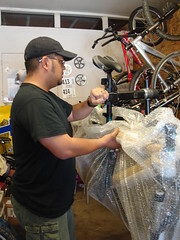 Unwrap the many rolls of cardboard and foam..
Usually most bikes will have the stem attached, but not the handle bar. Go ahead and mount the bar and make sure its lined up pretty nice. You’ll need to tighten the pedals down. 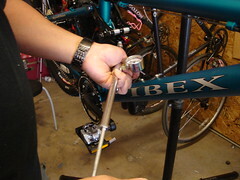 Ibex send this really cool pedal wrench with the bike! Most of the time bikes are sent dialed in. 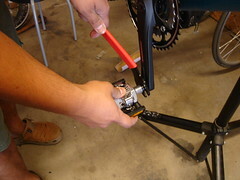 If you are having some shifting problems, turn the adjuster barrel a few times to get it just right. After you’ve pieced everything together, go out for a test ride! Are you working on your own bike yet? Or are you still paying someone to do it for you? I think you missed a few very KEY items, like adjusting the gears/brakes, setting up suspension, torque spec, etc etc. Check this out for a little more detail.. it is a multi segment how to. hmm I’m not sure why my link didn’t work! Just copy and paste into your browser window. Did you happen to ride the bike with those platforms still in? Lance is the one testing the bike and by the way it looks on his first impressions, he left the platforms on there. They’re actually platform on one side and clipless on the other. I love the pedals with both! Me too Lance! I have dual platforms on the AM2000 and on some of my commuter bikes. The rest of my bikes are fitted with Crank Bros. It looks like the “demo” platform that shimano puts in their pedals for riding around the parking lot during test rides. The platform is supposed to be removed by your local bike shop before the bike goes home. 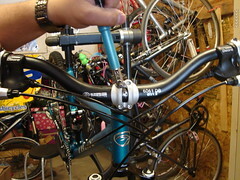 It can be a liability if the shop lets the bike out with those plastic blocks that come unclipped or break easily. 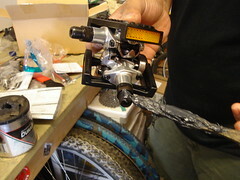 Dual pedals are available from shimano and others but those aren’t them! Funny, I’ve ridden those ‘demo’ platforms for almost a year and on gnarly terrain and they are yet to either break or become unclipped. Maybe shimano’s off-road and your off road are different? You have not really explained anything here. 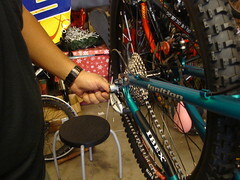 less about how not to hurt your back and more about attaching adjusting brakes/gears.